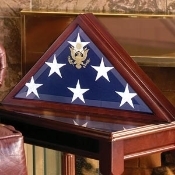 burial flag display cases - are hand crafted by veterans and made of real wood,burial flag display cases are perfect to present the flag that was covering the casket over a military funeral . American made American flag cases from Flags Connections are handcrafted to last. These heirlooms will show off veteran flags and memorabilia from all of the armed services including the Army, Air Force, Marines, Navy, the US coast. American Flag Cases are the best way to say thank-you to those who have, and are still serving the United States of America. 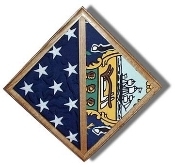 Flags Connections carry unique American flag display boxes unlike anything else you will see on the web. American Flag Frames are the best way to display more than one flag. The 3 Bay Military Shadow Box, and 3 Bay American Flag Display case is available in Red Oak, and comes with a black, blue, red or green background. These beautifully made cases can also be handcrafted out of Walnut or Cherry upon request. Display one, two, or three flags, or add military memorabilia in the center of the frame. Buy American flag cases for fallen hero’s or for a friend or family member who is about to be deployed. American Flag Shadow Boxes, like the Military Shadow Flag and Medal Box, is the perfect size case and is available in Walnut or Red Oak with a blue, green, black or red background. These boxes can hold up to a 3’ x 5’ flag and include the mounting bracket. It is important to buy American flag cases to display flags, medals, and documents. American Military Flag display cases come in a variety of shapes and sizes and can be displayed on a shelf, mantle or on a wall. 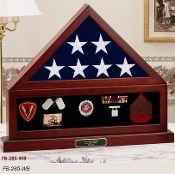 The uniquely shaped Octagon Military Shadow Box adds a nice touch to military memorabilia with plenty of space for flags, medals, and documents. Add military brass service medallions to give your Octagon Military Shadow Box a classic look. The Octagon Military Shadow Box comes in Cherry, Walnut, or Red Oak with a black, blue, green or red background. Flags Connections has a selection of flags to add to your American Flag Case. These flags are high quality and made out of a variety of materials including Super Tough brand polyester and nylon. Buy American Flag Cases to hold your new American Flag and show the world how proud you are to be an American. You can even buy accessories for your American Flag Case including vinyl flag covers, engraved brass plates, personalized nameplates, and military service medallions in solid brass. Order your display cases and shadow boxes today from Flags Connections and show the world why it is important to buy American Flag Display Cases. How Important Is It To Buy American Flag Cases? American made American flag cases from Flags Connections are handcrafted to last. These heirlooms will show off veteran flags and memorabilia from all of the armed services including the Army, Air Force, Marines, Navy, the US coast. American Flag Cases are the best way to say thank-you to those who have, and are still serving the United States of America. Flags Connections carry unique American flag display boxes unlike anything else you will see on the web. American Flag Frames are the best way to display more than one flag. The 3 Bay Military Shadow Box, and 3 Bay American Flag Display case is available in Red Oak, and comes with a black, blue, red or green background. These beautifully made cases can also be handcrafted out of Walnut or Cherry upon request. Display one, two, or three flags, or add military memorabilia in the center of the frame. Buy American flag cases for fallen hero’s or for a friend or family member who is about to be deployed. 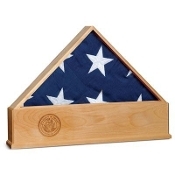 American Flag Shadow Boxes, like the Military Shadow Flag and Medal Box, is the perfect size case and is available in Walnut or Red Oak with a blue, green, black or red background. These boxes can hold up to a 3’ x 5’ flag and include the mounting bracket. It is important to buy American flag cases to display flags, medals, and documents. American Military Flag display cases come in a variety of shapes and sizes and can be displayed on a shelf, mantle or on a wall. The uniquely shaped Octagon Military Shadow Box adds a nice touch to military memorabilia with plenty of space for flags, medals, and documents. Add military brass service medallions to give your Octagon Military Shadow Box a classic look. 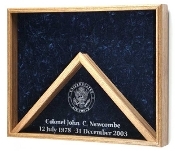 The Octagon Military Shadow Box comes in Cherry, Walnut, or Red Oak with a black, blue, green or red background. Flags Connections has a selection of flags to add to your American Flag Case. These flags are high quality and made out of a variety of materials including Super Tough brand polyester and nylon. Buy American Flag Cases to hold your new American Flag and show the world how proud you are to be an American. You can even buy accessories for your American Flag Case including vinyl flag covers, engraved brass plates, personalized nameplates, and military service medallions in solid brass. Order your display cases and shadow boxes today from Flags Connections and show the world why it is important to buy American Flag Display Cases.